Not Just an Atom, but the original Atom V.
This is reputed to be the original Atom V that Edgar Westbury experimented with in the 1930s. it is believed that he did not build any of his engines but relied on friends to create them. 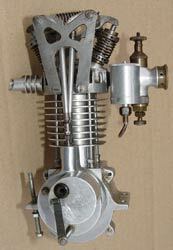 This motor was part of Gerry Buck's extensive collection, having come from Colonel Bowden, who did a great deal of work and experiment with Westbury. The Atom V was the last of the family of motors carrying that name that Westbury designed, starting with the 52cc Atom I from 1925. The Atom II was reduced to 30cc for hydroplane use but was destroyed in a bench test and so was developed into the Atom III. The IV was for aircraft use and never developed. The rest of the family and another Westbury original will be featured next month. One of the true icons of the tethered hydroplane world was Mons. Gems Suzor, who started competing around 1921 and attended the first ever MPBA regatta at Victoria Park in 1925. 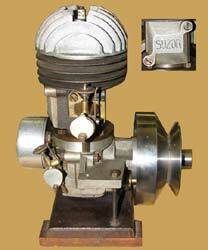 Suzor worked primarily with two strokes, driving on the development of this type of engine. He was a 'lateral thinker' with his ideas, especially on inlet systems and eventually ended up with six carburettors on one engine. 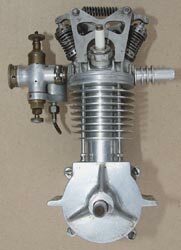 This superbly engineered 30cc example with his name prominent on the transfer cover has just two carburettors and was probably built from castings that Suzor produced and sold via his Paris model shop. As well as the shop, he was a prolific author and magazine publisher, and continued to run his boats in France and England through to 1964, when he made his last trip to the International regatta. Large, and a record holder. It would be wrong to make absolute claims about relative sizes, but these two certainly represent extremes and both date from 1951. 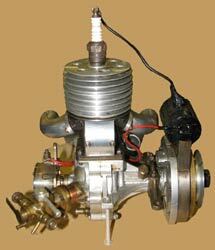 The diminutive 0.8cc diesel has seen service in both a tethered boat and a car and is yet another example of the amazing variety of two and four-stroke engines produced by Doug Reynolds. Along with his other motors, this lovely little piece of 'watch making' was extensively refurbished by him in 1992.The amazing story of Doug and his modelling career has already been recorded by OTW and can be seen by clicking here. 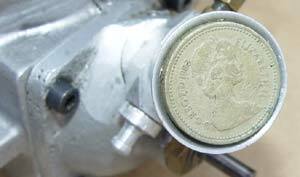 The same £1 coin that shows the scale of the diesel, neatly fits into the venturi of this massive 30cc hydroplane motor. This is just a taster as the whole motor will be featured in a later pitbox, when its history is fully unravelled. What is known is that it came from the most competitive era of American tethered hydroplane racing when the likes of Bob Palmer, Charles Watkins, Ed Kalfus and Tom Perzentka were producing superbly engineered racing motors. 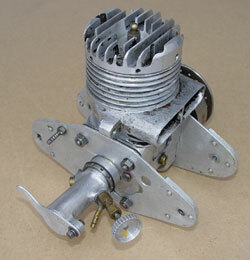 In 1951 this motor took the American 'A' class record at 81 mph. Miniature masterpiece from H.L Sharvell. A Gerald Smith 'Head Scratcher'. Stan Clifford started with flash steam in the early years of the last century, moved on to four-strokes in the 30s and 40s and then set about developing his own version of the 30cc two-stroke in the 50s and 60s. 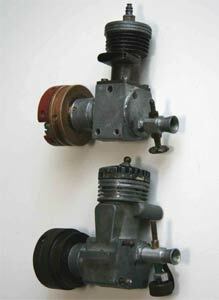 Much of his effort was spent on alternatives to the rotary valve in use on most engines. He experimented with engine layouts, fuel injection, different patterns of reed valves and all manner of other intriguing ideas. Mark Russell kindly sent this photo months ago hoping that it could be identified. After consulting all known engine 'sages' through the autumn it is still unidentified. Can anyone help? 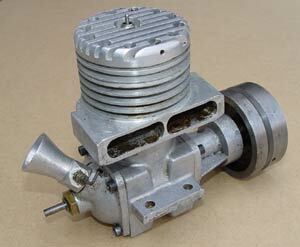 The vertically split crankcase is not so common and might give a clue and the torpedo shaped tank at the rear looks original. 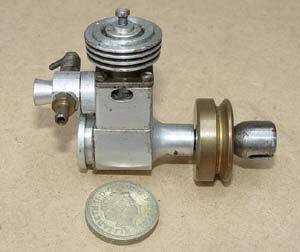 With a bore and stroke at around 3/4" it gives a capacity of just under 6cc which was a common size in the 1940s. The engine is about the same size as a Stentor and the flywheel is 3" dia to give an idea of scale. As can be seen, it is very much a 'Pitbox' item, obviously having been consigned to a shed (or worse) a long while ago. 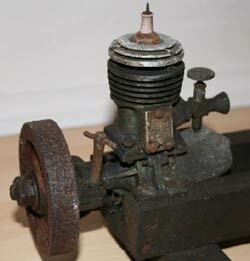 Under the grime it is however a very nice and unusual motor and knowing its origins would be a distinct benefit.